Are relationship martyrs really selfless? The local love stories we encounter on the big and small screens, and even in the pages of books, are riddled with relationship martyrs—people who will do even the most humiliating things in the name of love, those who believe that loving deeply means enduring excruciating and never-ending pain, and those who wear their endurance like a badge of honor. In Jollibee’s “Vow,” the martyr is the narrator. He makes a fool out of himself; he pushes a beat-up car and is left behind; he waits until late at night for the woman he likes to get off work (perhaps to take her home—the usual gesture Pinoys do), because he believes she’s the person for him. He even makes a promise that he’ll be the man for her as she walks down the aisle to marry another guy. While the commercial doesn’t reveal any hint of bitterness or resentment on his part, we know the narrator is hurting deep inside. We see it in the way his eyes welled with tears and even reddened when he made eye contact with her. We feel his pain when we ourselves find out that she’s tying the knot with someone else, all the while listening to him profess his love for her in his head. Apart from taking the lengths he did to court the woman, what makes him a martyr is also his refusal to give himself space away from her so he can finally move on and eventually love and be happy with someone else. By making promises like “I will be the man for you,” “I’ll be there whenever you need me,” and “I will never change,” he’s only opening himself up to more pain if he fulfills them (and he most likely will). That’s because the woman will be married and the man for her will first and foremost be her husband. And that’s the thing: He’s settling to be second best in her life, when he could be “the man” of someone who loves and appreciates him wholeheartedly like no one else does. Why he’s doing this to himself, we can only guess. But it’s important to note that from the beginning, he “knew” she was The One. He’s clearly wrong about her being the person for him, but he’s not accepting or even acknowledging his error. A fairly recent hit of a movie that portrays this relationship martyr is Starting Over Again (2014). Actions begin to be more ridiculous as Ginny (Toni Gonzaga) tries to win over an already taken Marco (Piolo Pascual). She flirts with him, seduces him, commutes all over Metro Manila in a day to see him. 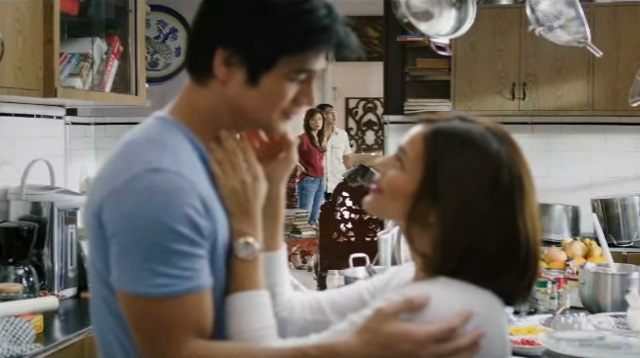 Worst of all, Ginny tries to make Pat (Iza Calzado), Marco’s girlfriend, break up with Marco by revealing that something happened between them when Pat was away. It’s either Ginny doesn’t know the line in terms of going too far, doesn’t think it exists, or knows it exists but doesn’t care. She just wants Marco back after having jilted him, and she was going to do everything, no matter how much of a fool it would make her look. As she experiences and claims to know, to love Marco is to suffer. And she hates it and loves it. Ginny could have saved herself from misery by being careful. Instead, she puts herself in undesirable situations. She then plays the victim by asking why all this has to hurt, as if she didn’t make the choice of working with Marco, as if Marco was the one who broke her heart, as if he could simply drop the life he built for himself for her just because she went out on a limb for him. Why would Ginny, a talented architect and fairly successful woman, throw herself at Marco? Marco proposes an answer in the film: that she is broken. This makes it easy for her to put herself out there with hardly any trace of self-respect and to misbehave, and that makes her depend on someone who once loved and knew everything about her. In Philippine literature, the female martyr is also a figure often written about. Linda in Rosario Cruz-Lucero’s short story “Family Rites” (1986) stays with her cheating husband who has come to sicken her, and whom she realizes she no longer loves. She does this to keep her family looking intact. Paz Latorena’s Soledad in the award-winning story “The Small Key” (1927) has been consumed with envy for her husband’s deceased first wife. She keeps her feelings to herself, so she cries by herself. Rather than talk out her insecurities and doubt for her husband’s love with him who does seem to care for her, she unhappily stays with him and tolerates the heartache. Then one day she burns the clothes of his first wife. She does it in the heat of the moment for her sanity, forgetting that if her husband found out, he would begin to resent her for the rest of their lives. When she realizes what she has done, Soledad is filled with fear and guilt, and then is struck with fever. As illustrated by these works, relationship martyrdom takes many forms: the hopelessly stubborn suitor; the broken, grieving ex who still tries to win back her former flame; the wife who tolerates her husband’s infidelity for her marriage or her family; the woman who keeps to herself and suffers on her own. And there are still others, like the woman who waits in vain for her partner to return home. These works also show that relationship martyrs exist in Philippine society. And that more importantly, some of them herald these martyrs as prime examples of true, selfless lovers. Some of us are led to agree through the cheesy music playing in the background or the focus on the weeping individual’s pain and resolve—all of them seek to appeal to our emotions. But it is just as likely that many of us already praise relationship martyrdom and that these works merely echo our views. Why then do we salute people who seem to throw their lives or their dignity away for the love of a particular person? Others have an image of themselves as righteous people and view suffering as a test of their integrity—and when they pass the test, the proof. Enduring misery then becomes opportunities for them to build or reinforce the identity they want for themselves—and people who are highly concerned with their self-image will naturally take that chance. Considering that, martyrdom seems more selfish than selfless. Another factor can be our dominant Christian/Catholic religion and beliefs, which are central to the lives of many Pinoys. There is no question that the Catholic Church reveres martyrs. It believes that martyrs “bear witness to the truth of the faith,” “to Christ,” and to the “Christian doctrine”; and that martyrs “endure death through an act of fortitude.” In fact, the Church wouldn’t be the Church without martyrs, who dedicated and risked their lives to spread their faith. Martyrdom is then a key element in the Church, and those of us who are taught the faith are told, with numerous Bible verses as support, to be ready or open to suffer martyrdom. Back in school, some of us were also taught the story of the prophet Hosea, who in the Bible continues to accept, forgive, and love his wife Gomer who keeps sleeping with other men. He is said to love unconditionally, which is how love should be; and when his love is likened to God’s—and aren’t Catholics told to aspire to be like God?—it follows then that it’s ideal to bear the pain and stay in such relationships. And then there’s God’s love and the image of the suffering Christ: that Christ’s suffering proves how much he loves us, precisely because he shouldn’t have been persecuted and yet he let himself be for our sake. Some of us absorbed these interpretations without question, and even sought to carry them out in real life. Putting our loved ones before ourselves is expected of many of us Pinays, hence also posing as an ideal. For instance, some of us are advised to stay with a philandering or abusive husband, because Philippine society requires women to think of their children, who must not grow up in a broken home because of the prejudices that come with separated parents. In addition, our society assumes that it’s the wife’s responsibility to keep the marriage intact, while it accepts that the husband has a mistress or two to show his machismo. Since that’s the traditional ideal for women (and many Pinoys are still traditional), these women who remain in empty marriages—and don’t complain—are praised for being so strong, loving, and dutiful. Perhaps this is also the reason behind the general silence of Latorena’s character Soledad and Cruz-Lucero’s Linda. As much as the Pinay wife is subjected to double standards in society, so are the men and the boys. In courtship, they are expected to be aggressive and to persevere when the girl plays hard to get. Their endurance for the challenges the girl is supposed to hurl their way attests to how much they love her and want to be with her. “Vow” narrator persists to do anything that will show his love to the woman. In a more modern take, Ginny in Starting Over Again does the same. Clearly, society highly regards hard work and perseverance as proof of sincerity and love. But where does one draw the line between perseverance and stubbornness? Both exhibit determination and firmness, but one obviously has negative connotations. Stubbornness rejects giving up and ignores facts about the situation that point to the impossibility of getting to the goal through certain means. On the other hand, to persevere is to never give up on your goal, but it also entails being flexible in how you get there. Martyrs can be persevering or stubborn, so if we’re going to praise them, it’s good to be keen on whether their actions are positive or negative. It seems that martyrdom has a lot to do with a certain lack of power, and the praising it with the ability to sympathize with this sense of powerlessness. The narrator of Jollibee’s “Vow” and Toni Gonzaga’s character Ginny don’t have a final say on the other person’s feelings. In courtship, the person who is liked has control. The wives in Cruz-Romero’s and Latorena’s short stories are under Philippine societal expectations. We can say that all of them exhibit strength by continuing to suffer and hauling the pain, or we can say that they are weak for not fighting to get out of their familiar cycle of misery for something frighteningly new. That said, our attitude toward relationship martyrs depends on us. Do we feel in control of our lives and our happiness, and how much are we in control of them? Do we think there’s always a way out of an unhappy, unhealthy, or toxic relationship? Do we prefer to do what we believe is good for us over minding what society has to say? Because if we do, we are likely to think that martyrdom is the way of passive people, people who play victims, of people who don’t think much about their own happiness to act on it—the kind that tells you to shoot for the moon rather than the kind that sinks you in your moral high ground.